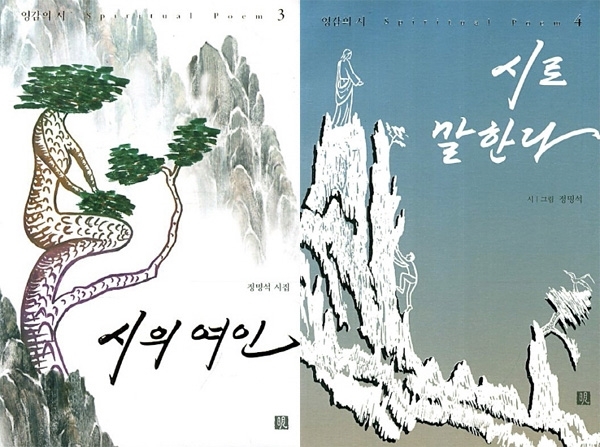 Poet Jung Myeong Seok’s poetry books, Woman of Poetry and Speaking Through Poetry, are becoming hot issues as they are bestsellers in the Kyobo Book Center. These poetry books that were simultaneously released in July have been fighting between first and second place in the poetry category, and have captured the hearts of readers. They were released as Poems of Inspiration series, [sequel] after the second volume of Poems of Inspiration, which was released in 1996, 17 years ago. The path of life he has been walking on as he encountered unbearable suffering and polished his heart, the Divine Being and poems that he wrote on his path. The third poetry book, Woman of Poetry, contains a life story of the poet who has been serving God of creation and the Holy Son of salvation as the Lord. He delivers that the core of a human being lies in ‘the heart, spirit, and soul,’ and the core of a life lies in ‘love.’ He received through inspiration as he deeply communicated in the world of the Divine Being, the origin of the core, and published the contents [he received] as a poetry book. In the preface of the book, the poet says, “The secrets of Heaven are hidden with parables so that people of poems will unravel them and realize the time period of God.” If people cannot unravel the secret things even after reading the poems like the poet said, there is no gratification in reading the poems, and the poet would also feel frustrated. The poet is waiting for a wise person to appear, someone who will realize and know his deep heart through wisdom, discern the time period, follow the times, and resolve his grief. Poem in another word is like a fruit that connotes life. It shows the poet’s ripened life as it is, the image of how he went through extreme suffering and polished his heart for a lifetime and completed his soul and spirit together with God by loving Him. The poems: “The Path of the Cross, “Poetry is Flowing,” “Love,” and “Being Harvested at the Hands of God” are composed of four segments. They enlighten the reasons of a valuable life: happiness amidst snowstorm, masterpiece after struggling, sweet taste after bitter taste, and resurrection after sacrifice. These poems also lead spirits and souls of those whose hearts resonate to this to be recreated beautifully, mysteriously, and majestically. Adding pictures that stand out with their sensible designs… increases the movement the poem gives. Especially in Speaking Through Poetry, the poet, who is also an artist, personally drew pictures that correspond to each poem. Just as a person can know what kind of tree it is by seeing its fruit, the pictures are art work that show sensible designs as one can know what kind of poem it is by looking at the pictures. One piece of drawing becomes one piece of poem and increases the movement the poem gives and leads the readers to reach the stage of realization of a higher level. Just as poems express secret things that cannot be measured in depth with simple words, drawings also, they are expressed with simple lines, yet they hold deep things of the poem as the core. The poet said, “If you put in drawings pertinent to the poem, it brings out flavors like putting spices on food, and gives harmony like a pine tree growing from a rock.” Like this, readers can appreciate two art works of different genre through one book, which creates synergy effect for the readers to receive double the movement and satisfaction. Poet Jung Myeong Seok was born in Geumsan-gun, Chungnam in 1945. After starting his literary career with the monthly magazine, The Trend of Literature, in 1995, he released four books of Poems of Inspiration. Also, 10 of his poems were recorded in the Unabridged Korean Poetry Dictionary (2011), which includes 100 years of Korean poetry history. Other than writing poems, he has been studying the Bible for the past 50 years and wrote Word of Salvation; sermon book, Word of Life; proverb book, Heaven’s Words, My Words and other religious writings as the president of Christian Gospel Mission. Also, he has mastered various fields in art and exhibited drawings and calligraphy domestically and internationally (English, France, Germany, Argentina, etc. ).